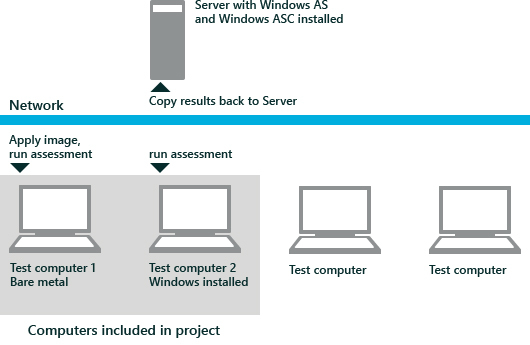 Automates the collection of results from test computers by using WinRM to copy results to the Windows Assessment Services server. This guide provides step-by-step guidance for installing the Windows Assessment Toolkit, configuring Windows Assessment Services and the Windows ASC, assessing multiple computers, and then reviewing results. You can use Windows Server® 2008 R2 in this scenario. However, Windows Server 2008 R2 does not support Dynamic Driver Provisioning (DDP) as described in step 1 and step 2, where it is used to add NIC drivers and import additional drivers to the driver store. You can work around this by using Deployment Image Servicing and Management (DISM) to add drivers to your Windows image offline. For more information, see Deployment Image Servicing and Management (DISM) Technical Reference. The test computers can be bare metal computers (no operating system installed), or computers that are running Windows® 8. For more information about system requirements, see Installation. You must install Windows Assessment Services on a server computer, which also installs Windows ASC on the server. You can also install a stand-alone version of Windows ASC on a client computer. For more information about how to install Windows Assessment Services and Windows ASC, see Installation. Adding NIC Drivers to the Windows PE image that Windows Deplyment Services uses. This step is required only when the test computers require out-of-box NIC drivers so that they have network connectivity during inventory or after the Windows image is deployed. Preparing the Windows PE USB drive for test computer inventory. To inventory bare metal computers, you must create a bootable USB drive to start the computer and add it to the inventory. Adding Test computers, images and unattended answer files to the inventory. Adding out-of-box drivers to the Windows Deployment Services driver store so that they’re available for driver injection during image deployment. For more information about how to do this, see Setup and Configuration. A project is a collection of assets that you want to assess. It identifies multiple computers and multiple images that are a subset of all the computers and images that you added to your inventory. A project provides a contextualized, manageable view of the assets of interest, and pairs up each computer with an image and answer file. A project does not contain assessments. In this step, you create a project by selecting a set of test computers from your inventory. If the computers that you select are bare metal computers, or you want to refresh the image on the test computer, you also select the images that you want to apply to each computer. Be sure to select images that match the architecture of your test computers. On the Getting Started page, click Create New Project. In the Project name text box, type Project1. In the Description text box, type a description. For example, This is a test run to learn how to use assessment services in my lab environment. In the Keywords text box, type keywords, such as Project1, and then click Next. In the Select machines to include in this project window, click Add and select the computer that you want to include in this project. Click OK and then click Next. In the Image Inventory window, click Add and select images to add to your project. Click OK and then click Finish. If your test computers already have a running operating system, you do not have to add images to the project. The Windows ASC home page opens. In this step, you create a job, adjust the settings, and store a job in your project. A job associates assets (a computer and a Windows image) with assessments. A job can contain multiple computers, the corresponding images and unattended answer files, and multiple assessments. You can select any number of assessments to run on your test computers, however, this guide demonstrates performing a single assessment on multiple test computers. On the Home page, click Create new job. In the New Job window, in the Job Name text box type Check Drivers. Create a custom job. If you select this option, you add assessments that are designed for general use in the Windows ASC when the custom job opens. Create a job from a Template. If you select this option, a template window opens and you add preconfigured jobs or assessments that have preconfigured settings. Create an energy efficiency job. If you select this option, you add assessments that are designed to run as workloads to test the battery life and energy efficiency on laptops. Click Create a custom job. In the new tab in Windows ASC, the job settings are highlighted by default. In the details pane on the right you can change the name, add a description, and add keywords to help you identify the job and the results. Enter keywords to help you identify the job in Search. Choose a Failure behavior from the drop down list, and then select Stop to stop the job if there is a failure since we are only running one assessment in this job. Under Configure analysis preference, select an option for when to analyze the results. By default, Complete analysis on server is selected. This option lets you free up the target computer for other uses, take advantage of the resources on the server to save time running the analysis, and use symbols already loaded on the server. Under Assessment, click Add Assessments. In the details pane on the right, click the plus sign (+) next to Driver Verification to add the assessment to the job. In the Windows ASC, under Job settings, click Overview, and then clear the Apply image check box. Under Job settings, click Assets, and then click Add to select the computers that you want run the job on. In the Select Evaluation Assets window, select the computers that already have a supported operating system installed, and then click Finish. In the Windows ASC, under Job settings, click Overview, and then select the Apply image check box. If you want to inject matching Plug and Play drivers from a Dynamic Driver Provisioning driver store during image deployment, select Dynamic Driver Provisioning. In the Select Evaluation Assets window, select the computers that you want to assess. Click Next, and then click Finish. The computers appear on the right side of the Windows ASC under Evaluation assets. Select a computer, click Change Image, select the image that you want to apply to that computer, and then click OK. The computer and the image architecture must match, except that you can select an x86-based image to deploy to an x64-based computer. You can run a job on all the assets that you added to the project, run a job on a subset of those assets, or run different jobs on different assets that are available in the project. In this step, you set the run-time settings, run the job and view the progress of the job. In the Windows ASC, click Run to start the job instance. In the Run Job dialog, enter Job instance tag and Test Pass information, and then click OK. The Job instance tag identifies the iteration, installation type, or focus of comparison. For example, OEM-Win7, Clean-Win7, OEM-Win8, Clean-Win8. You can run a job many times. Therefore, you can have multiple instances of the job. The Test Pass represents a milestone, a logical set of computers, or other differentiations, for example, Phase A, Phase B, Phase C, Phase D. These keywords help you identify the appropriate results when you search through a list of results, but they are not required fields. When the job finishes, the results are copied back to the server at \%WAS-Server%\relax\results%Project%%TestPass%%JobName%%ComputerName%%JobInstanceTag%_%TimeStamp%. When the Results tab opens, review the progress of the job on each computer. In the Windows ASC, in the Monitor Instances window, click View Details. Click the name of the computer, to see additional details about the progress of the job running on that computer. If you are applying an image to your test machine, it might take a few minutes for the task to finish. By default, when you open multiple results in Windows ASC, you get a summary view of the results. The summary view displays each job instance as a column. Below the overview tables, metrics for each assessment in the job instance appear as a chart. This summary contains information about the computer, the job that was run, and overall metrics that were measured. It provides a visual comparison of the same metric across several job instances, and lets you select which metrics are displayed. This view of the results can help you identify individual computers in your lab environment that need quality improvements. In this step, you view the results for the completed job. Click the back arrow to return to the job instance view. Verify that the job is complete, select the job, and then click View Results. The View Results button is unavailable until a job instance is complete and highlighted. On the Results Overview page, review the total number of Errors and Warnings that were reported for each computer in the Overview: Overall issues table. All visible metrics have bar charts under the overview tables. In one of the assessment metric rows, such as Driver verification: Devices Missing drivers click Sort to arrange the graph in an ascending or descending order. Select the first bar in the chart to highlight the corresponding column in the Overview. Click View details in the lower-right corner, to view detailed job results for the selected computer. Expand the metric that has the highest value, and select an individual issue to see more information in the details pane on the right. In the Issues pane, expand one of the issues to see what is recommended for remediation. For example, removing extra drivers is recommended if you have devices with multiple drivers. If extra drivers are listed, browse to the file location for that computer, specified under Extra drivers that can be removed, and delete extra drivers. When you run the job again, you should notice that you do not have extra drivers. Running multiple assessments on test computers. Running the same set of assessments on a single computer, but using different images. Viewing comparison reports for assessment jobs that have different images. Capturing and deploying images of other formats. Create another job and try other assessments, add more computers, or use a different image. If you ran the last job using Windows Assessment Services to deploy Windows to computers, you can save time by assessing computers that already have Windows® 8 installed.